The frame of the first factory on a ground-breaking new development is rising into the sky after it was announced French car parts manufacturer, SNOP, is relocating to the International Advanced Manufacturing Park (IAMP), creating more than 100 new jobs. SNOP has committed to move its team to a £15m manufacturing plant on the IAMP, a nationally significant development site close to Nissan, that is expected to become home to more than 7,000 jobs. The company, which makes components for the likes of Peugeot, Audi, Renault, Mercedes, Volkswagen and Seat, as well as Nissan, will be the first to relocate to IAMP. 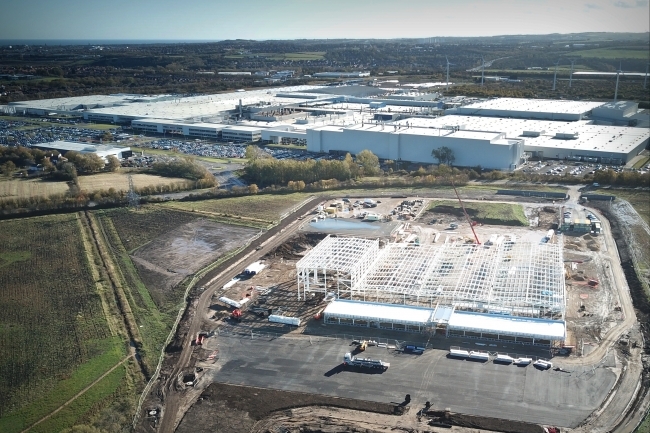 The frame of the firm’s new factory – which is being constructed by North East-based Howard Russell – is now fully in place, with work set to complete in spring. SNOP will take more than 17 acres of the first phase of IAMP, opening a 235,000 sq ft state-of-the-art factory and office space, with the potential to expand to 331,000 sq ft.
Plant Director at SNOP UK, David Brander, said: “We are delighted to be the first business to make the International Advanced Manufacturing Park our home. SNOP will relocate from its existing premises nearby, taking on more people and significantly increasing its floorspace. With the additional capacity created, the company expects to see turnover grow from 54m Euros to 90m, with an additional 100-150 jobs created in the process, on top of the firm’s existing 250-strong team. 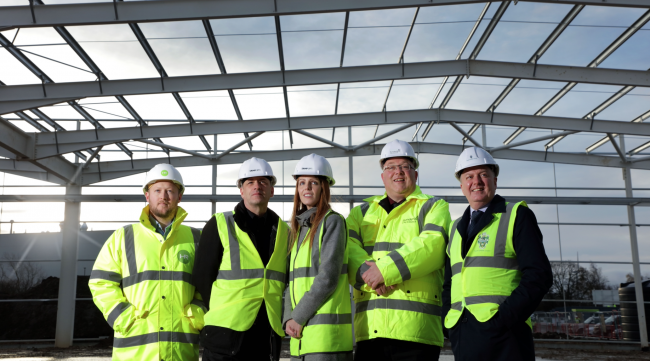 Leader of Sunderland City Council, Graeme Miller, added: “We are delighted to see SNOP choose the IAMP as its new base and to see such visible signs of progress on the site, with the frame now filling the sky. SNOP is investing more than £15m in the new building and an additional 15m Euros in new machinery. It is working with Silverstone Building Consultancy to project manage the construction project, with the building expected to fully handed-over in May 2019. Cramlington-headquartered construction firm Howard Russell is building the new facility on behalf of SNOP UK. As a result, the firm has been able to recruit two new apprentices as well as creating three new permanent jobs including an engineer, a contracts manager and a pre-construction manager, with the need for a number of additional roles in the near future. At the heart of the North East, IAMP is located next to the UK’s largest car manufacturing plant, Nissan, and will provide a world-class environment for the automotive supply chain and related advanced manufacturing businesses. The park is being delivered in partnership by Sunderland City Council and South Tyneside Council. IAMP One covers 150 acres and will deliver 1.6m sq ft of advanced manufacturing and industrial space. The second phase will provide an additional 2.6m sq ft, creating a scheme of significant size and scale. UK Government has pledged £42m from the Local Growth Deal through the North East Local Enterprise Partnership (LEP) towards infrastructure including new roads, bridges and environmental enhancements to support the development. The Local Growth Deal is supporting major capital investments to promote innovation, economic and skills infrastructure and sustainable transport as part of the North East Growth Deal.